On 3 July 2016, a coordinated bomb attack in Baghdad resulting in the deaths of over 300 and injured hundreds more. A few minutes after midnight local time (2 July, 21:00 UTC), a suicide truck targeted the mainly Shia district of Karrada, busy with late night shoppers for Ramadan. A second roadside bomb was detonated in the suburb of Sha'ab, killing at least five. The Islamic State issued a statement claiming responsibility for the attack, naming the Karrada bomber as Abu Maha al-Iraqi. There were reports that the source of the blast was a refrigerator van packed with explosives. The explosion caused a huge fire on the main street. Several buildings, including the popular Hadi Center, were badly damaged. The bombing is the second-worst suicide attack in Iraq by death toll after the 2007 Yazidi communities bombings and the deadliest terrorist attack in Iraq carried out by a single bomber. The 17 May 2016 Baghdad bombings were perpetrated by ISIS, killing over 101 people. Some security analysts saw the bombings in Iraq's capital as an effort to distract the attention of the Iraqi security forces from the battle of Fallujah. The 2016 battle of Fallujah came to a close in June 2016 with the Iraqi government regaining control of the city of Fallujah from ISIS. The Baghdad bombings were the third mass killing of civilians by ISIS-affiliated militants in recent days, following the 28 June attack in Istanbul, Turkey, and the 1 July attack in Dhaka, Bangladesh. ISIS has recently sent out calls for increased attacks during the month long celebration of Ramadan. The suicide truck bomb hit a shopping area in Karrada, where many people were on the street during the evening in order to shop and to break their Ramadan fast with iftar at local cafes. The bomb was concealed within a refrigerator truck driven by a suicide bomber. It was the first major assault in Baghdad since the Iraqi government's recapture of Fallujah from the Islamic State in June 2016. A Western security source in Baghdad told the BBC the bomb used "a new tactic which helped it to move undetected through checkpoints ... We've never seen it before, and it's very worrying." The bombers reportedly used a "unique" mix of chemicals for the bomb. "We are used to big fires but the chemicals in this bomb were used for the first time in Iraq," according to Brigadier General Kadhim Bashir Saleh of the Iraqi Civil Defense Force. 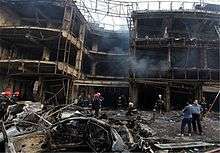 On the aftermath of the attack, Baghdad Operations Command claimed that it had arrested members of a militant cell who were connected to the bombing. A second roadside explosion occurred in the largely Shia suburb of Sha'ab in northern Baghdad around midnight, killing at least five people and injuring 16. A third bombing that targeted members of al-Hashd al-Shaabi killed one person and injured five. The bomb was an IED and took place in Abu Gharib district in Baghdad. A vehicle was also damaged. A fourth bombing in al-Latifiya in southern Baghdad was a car bombing that killed one person and injured an unknown number of people. The bomb was placed under a civilian vehicle, and went off when the vehicle was being driven. So far, the casualties from the four bombings during the day in Baghdad include over 341 people killed and over 246 people injured. The Iraqi Ministry of Defence revealed that at least 167 had been killed and over 180 injured, with those numbers expected to rise. Reports from the scene indicated that many of those killed were children. After initial reports, the death toll continued to rise as further corpses were recovered from the rubble and injured victims died of their injuries. It is the deadliest attack in Iraq thus far in 2016. The Islamic State of Iraq and the Levant issued a statement claiming that it was responsible for the attack and that it had deliberately targeted Shia Muslims, further identifying the suicide bomber as Abu Maha al-Iraqi. Their involvement in the attack has yet to be independently verified. Jasim al-Bahadli, a former army officer and security analyst in Baghdad, stated that the attack was ISIS' attempt to "compensate for their humiliating defeat in Falluja". After reporting in their most recent death toll, the Iraqi Ministry of Defence issues a statement that admitted that they were overwhelmed, with not enough resources, military checkpoints, and intelligence services to properly manage the security of Baghdad. On 5 July, Interior Minister Mohammed Al-Ghabban resigned, which was accepted. The Interior ministry is responsible for police but not other forces providing security in Baghdad. In his resignation, al-Ghabban said that the security system was "fundamentally flawed" and called for changes to increase the ministry's power. Lieutenant General Abdulamir al-Shimmari, head of the Baghdad Operations Command of the Iraqi Army, along with the head of the division responsible for intelligence on Baghdad at the Ministry of the Interior and the official responsible for Baghdad in the national security adviser's office were removed from their posts by al-Abadi. Five convicts were executed and 40 suspected jihadists were arrested following the attack. Wikimedia Commons has media related to 2016 Karrada bombing. ↑ "Baghdad blast killed 292, many burned alive". AFP. 7 July 2016. Retrieved 7 July 2016. 1 2 3 4 5 Chulov, Martin (3 July 2016). "Isis claims responsibility for Baghdad car bombing as 120 die on single day". The Guardian. ↑ Salaheddin, Sinan (30 May 2016). "Iraqi forces push into Fallujah as IS bombings kill 24". Bigstory.ap.org. Retrieved 4 July 2016. ↑ "119 dead as car bomb rips through Baghdad shoppers". The Hindu. AFP. 4 July 2016. It came a week after Iraqi security forces recaptured Fallujah from IS, leaving Mosul as the only Iraqi city under the jihadist group's control. ↑ Hassan, Falih; Arango, Tim (3 July 2016). "Bombing Kills More Than 120 in Baghdad". The New York Times. ↑ CNN, Euan McKirdy. "ISIS: More attacks on West during Ramadan". CNN. Retrieved 5 July 2016. 1 2 3 4 5 6 "Nearly 120 killed in overnight Baghdad bombings claimed by Islamic State". Reuters. 3 July 2016. 1 2 "Baghdad bombing: ISIS claims responsibility; suicide bomber's identity revealed". Iraqi News. 3 July 2016. 1 2 3 4 5 6 7 8 9 "Iraq violence: IS bombing kills 125 Ramadan shoppers in Baghdad". BBC News. 3 July 2016. 1 2 Doucet, Lyse (28 July 2016). "Iraq violence: Did IS use new type of bomb for deadliest attack?". BBC News. Retrieved 28 July 2016. 1 2 "Iraq PM sacks Baghdad security chiefs after deadly blast". al-Monitor. Retrieved 8 July 2016. ↑ "Death toll from Islamic State attack in Baghdad rises to 292". Times of Israel. 7 July 2016. Retrieved 17 July 2016. ↑ "Fury over insecurity as Iraqis mourn 200 dead in Baghdad blast". Yahoo! News. 4 July 2016. Retrieved 4 July 2016. ↑ "ISIS car bomb kills more than 100 in Baghdad". CTV News. 2 July 2016. Retrieved 4 July 2016. ↑ "Baghdad suicide bomb attack death toll rises to 165, 225 injured". The Star. 4 July 2016. Retrieved 6 July 2016. 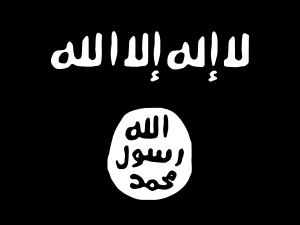 ↑ "Nearly 120 killed in overnight Baghdad bombings claimed by Islamic State". 3 July 2016 – via Reuters. ↑ Hussain, Murtaza (23 November 2015). "This Fake Bomb Detector Is Blamed for Hundreds of Deaths. It's Still in Use.". Retrieved 7 August 2016. ↑ "Death toll in Baghdad bombing rises to 324: ministry". Reuters. 31 July 2016. Retrieved 2 August 2016. ↑ Loaa, Adel (3 July 2016). "Bomb explosion in western Baghdad, one al-Hashd al-Shaabi member killed". Iraqi News. Retrieved 4 July 2016. ↑ Sarhan, Amre (3 July 2016). "Car bomb blast kills civilian in al-Latifiya in southern Baghdad". Iraqi News. Retrieved 4 July 2016. 1 2 Adel, Loaa (3 July 2016). "Baghdad bombing: Casualties in Karrada rise to 347 – Iraqi News". 1 2 Adel, Loaa (3 July 2016). "Baghdad bombing: Scores of people dead, dozens injured". Iraqi News. ↑ "Bom Baghdad Tewaskan 120 Orang, Irak Umumkan Berkabung Nasional". 4 July 2016. ↑ Sarhan, Amre (3 July 2016). "Baghdad bombing: Abadi announces three-day mourning for Karrada victims - Iraqi News". ↑ "PressTV-Iraq PM accepts interior min. resignation". Presstv.com. 2016-01-09. Retrieved 2016-07-06. ↑ "Iraqi minister submits resignation over Baghdad bombing - News from". Al Jazeera. Retrieved 2016-07-06. ↑ Iddon, Paul. "Will Baghdad's deadliest bombing affect plans to liberate Mosul?". Rudaw. Retrieved 8 July 2016. 1 2 3 "PressTV-Saudi silence surprises, but also angers Iraqis". Presstv.com. Retrieved 2016-07-06. ↑ "More than 120 killed in Islamic State's worst bomb attack in the Iraqi capital". Chicago Tribune. 4 July 2016. Retrieved 4 July 2016. ↑ "Iraqis want crackdown on 'sleeper cells' after huge Baghdad bomb". Reuters. 5 July 2016. Retrieved 5 July 2016. ↑ "Thousands gather to mourn victims of Baghdad blast". al-Monitor. Retrieved 8 July 2016. ↑ Satherley, Dan (6 July 2016). "Sky Tower to honour Iraqi dead". Newshub. Retrieved 6 July 2016. ↑ Barrat, Nicola (6 July 2016). "Sky Tower lights up in honour of Baghdad bomb victims". New Zealand Herald. Retrieved 6 July 2016.